Pete Rose was denied reinstatement by Major League Baseball last week…and they are 100% correct. 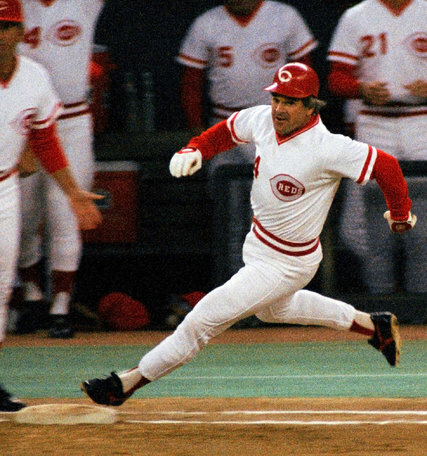 Pete Rose erred back in the 1980s and a lot of times since, lied about it, finally came clean, yet still does the actions (which are not illegal) and hasn’t fully atoned for his sins. Because of all that Pete Rose should NOT be allowed back into baseball. He shouldn’t be allowed as a manager. He shouldn’t be allowed to partake in MLB ceremonies and the likes. However, he does deserve to be in the Hall of Fame, and the reasoning is simple. The Hall of Fame is a place for people to go to learn about the history of the sport, and see the greatest players that have played the game. And while Pete Rose may have wronged some people with his actions, he is still part of the history of the game. None of his actions affected his 4,256 hits, 3,562 games played or 3,215 singles…all of which are Major League records to this day (among other records he holds for At-Bats and Outs). Three World Series, batting titles, and an MVP and Rookie of the Year Award are all despite his betting on the sport. Bet all you want, but only talent will make you a 17-time All Star.